ya know how lots of websites have Frequently Asked Questions pages? well, i was reading through my e-mail this morning and was marveling at how many questions i regularly get that i don't have good answers for and it all of the sudden occurred to me as clear as day - i need a Frequently Unanswered Questions post! plus it turns into FUQ which is just funny and a little naughty and you know that's just my style. SO - here we go. CAN YOU GIVE ME ADVICE ABOUT FOLLOWING MY DREAMS? why yes, yes i can. i think i get this question a lot because people hear about this guy who fell in love with bread baking and then turned it into a successful business and voila! but obviously it's not that simple. so first of all: dreams really do come true. but before your dream can come true you have to *have a dream*, so i would like to congratulate you if you are able to say that. and if you don't have a clearly defined dream that's just fine, these things take time and luckily life is long and you can do this. and right after that i want to remind you of something you already know: it takes a lot of hard work to make your dreams come true. and maybe even a little bit of luck. regardless, the most important thing to remember is that it is possible, i.e. don't take no for an answer, i.e. roll up your sleeves and make it happen, i.e. think outside the box, i.e. spend time alone with yourself and get to know the nooks and crannies of your dreams because if you don't do that you will end up getting confused about what it is that you actually want and you will be working so so hard for some mish mash of your dreams and other people's dreams and then wtf are you doing? This is Fritz Durst, farmer extraordinaire, in his element, following his dreams. in hindsight bread baking is a perfect match for these criteria, but i'd never considered it til George came by with that sourdough starter. but there are plenty of other careers that could have been a good fit, just so happens i became a bread baker. 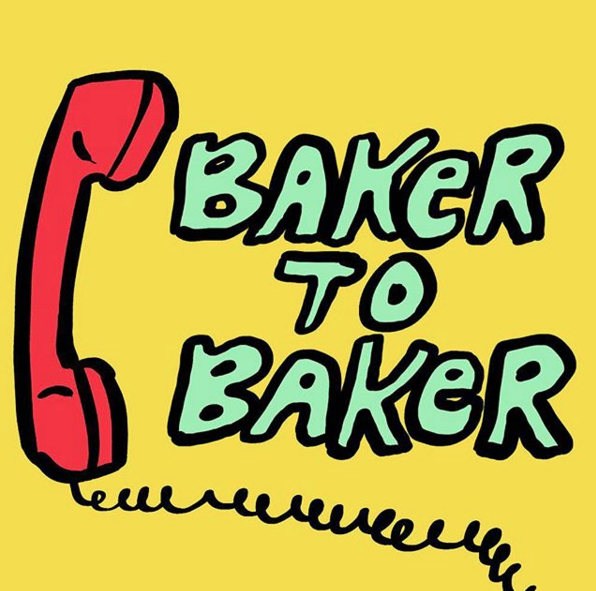 and my last name is Baker, so that sort of seems like it was written in the stars, right? ;) moral of the story is that the only way your dream will come true is if you make sure that it's YOUR dream. reflecting on the moments of your days is a good place to start/end. and don't let anybody tell you it can't happen, because if you do, they'll be right. WHAT IS HAPPENING WITH YOUR PODCAST? I AM SEARCHING FOR IT AND NOT FINDING IT...??? Rob Moss Wilson, @robmosswilson, made this super tight podcast logo for me. I SAW SOME OF YOUR VIDEOS ABOUT MAKING GOOD BREAD AND I GOT ALL EXCITED!! CAN YOU GIVE ME SOME MORE ADVICE ABOUT MAKING GOOD BREAD AT HOME? now that's a real doozy. the very first thing i have to say is when you have 6 minutes to spare just settle down and watch this video of the late Alan Scott. i stumbled upon this a while back before i knew anything about bread or baking or Alan, and his spirit shone through so strongly that i just had to see what exactly he was talking about for myself. could go on for hours about that, but the next thing i'd have to say is get this if you haven't already. ;) and watch these if you haven't already. but really what it comes down to if i cut to the chase and stop promoting myself is that the most helpful thing of all is having a regular baking practice. i mean, that sounds really nice, right? why don't you just go ahead and say it out loud right now. "a regular baking practice." did you say it? if not, i am going to urge you once again, you can say it really quietly, even a whisper, but just try saying it to yourself, out loud. "a regular baking practice." this means that at least once a week you bake a loaf of bread, start to finish. this is a very nice way to spend time and it teaches you all sorts of important things about bread and life and just give it a shot already if you have any inkling, you'll see what i mean. plus you'll then have a loaf of bread, which makes for a beautiful gift or a meal or if push comes to shove you can put it in your freezer and eat it one day down the road when you don't feel like baking bread. there are plenty of other FUQs out there, but they will have to wait for another day. til then, be well my friends.